Campaign Complete. This project has ended on December 5, 2016. No more contributions can be made. All funds will be collected by December 5, 2016. I am the team leader of BNDS_China, and a eleventh grader. Molecular biology is my favorite field, and I had fully involved in and finished the 2015 Science Talent Program at Tsing Hua University. During that time, I have learned many experience about how to conduct a molecular biology research project. I am now studying at Beijing National Day School, China. 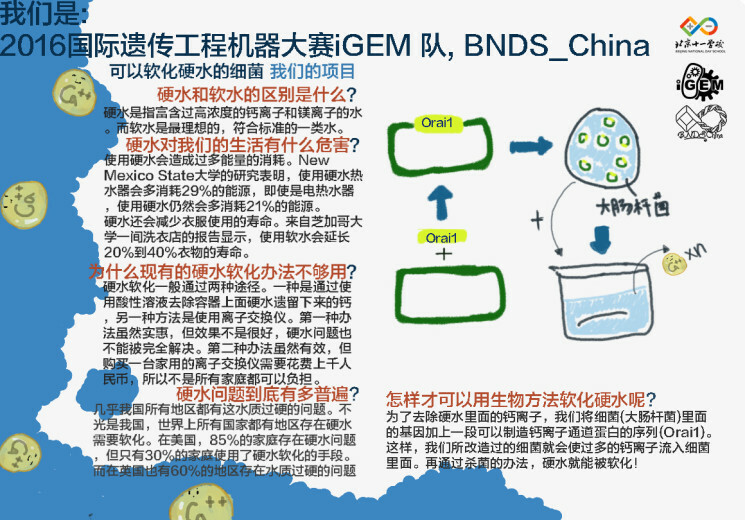 iGEM is my first time to create useful bacteria and give other high school students the chance to do research. Report: Thank you for your support! We will send you a report explaining what we found. Postcard: Thank you for your support, we will send you a thank you postcard and electronic copy of the report. Live Seminar: For those of you near Beijing, we will invite you to our lab and present our findings. Lab experience: We will let you run an experiment with us and let you have a go with a friend! The area we are researching is to create a bacterial hard water softener. Water hardness is a global problem which affects both the cost of living and environmental impact of a household. A study done by New Mexico State University showed that 29% more energy was used by gas heaters and 21% more with electric heaters run on hard water. The Association Français pour l’Etude des Eaux found soap and detergent use more than doubled in hard water areas. Hard water also has an effect on the fabric life, which is the longevity of clothes. A study carried out in a Chicago YMCA laundry, found that softening the water supply increased the life of frequently washed household items such as sheets, pillow slips and bath towels by 20-40%. As a team of high school students hoping to become scientists, we want to work on finding a solution to this problem. Despite the bacterial hard water softener that we are trying to create, there are also other kinds of water softener, such as Ion-exchange resin devices. However, all of those water softeners are all chemical methods that demand high prices. People so far have never tried to solve this problem in a biological way, which is what we are trying to do. Our strategy is to create a biological hard water softener by using certain genes that are coded with a function which eliminates ions in water. In our project, we chose a gene to put into the bacteria from human beings that can absorb calcium ions. However, the biological environment in human beings is totally different from the environment in the bacteria. Though the gene code in a bacterial environment is able to absorb calcium ions, its specific function remains unknown. Finding this function is the goal of our project. How will the research add to what we know? To our knowledge, no one has tried to soften hard water by modifying bacteria. The aim of our experiment is to identify a gene that can be integrated into bacteria to enable it to attach to calcium ions in hard water. The bacteria with the calcium ions attached can then be eliminated by using a bacterial filter or other sterilising methods. Our aim is to make progress towards solving the problem of water hardness so families can reduce their energy and soap consumption. Explain why you believe this research is important? Our research is important for two reasons. 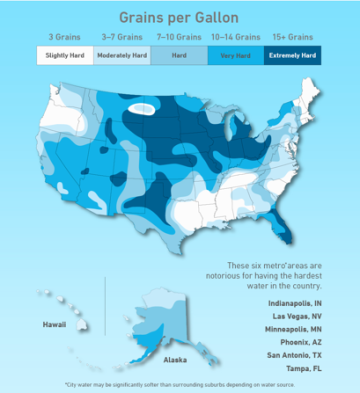 First and foremost, there is still no appropriate solutions for the global issue of water hardness and secondly, if we find a scalable solution it has the potential to have a positive impact on many lives as well as contribute to reducing carbon emissions by increasing the efficiency of energy consumption. In hard water areas calcium precipitates keep forming on containers. The calcium precipitates on the containers make them hard to open and hard to wash. Though the little amount of calcium in hard water cannot be a major cause of a certain disease, it can cause kidney stones and dehydration. Studies show that softened water is preferable to hard water, since it is associated with a lower risk for recurrence of kidney stones. Though the calcium precipitates on containers are able to be eliminated by using chemical solutions, this method failed to solve the problem thoroughly. However, it is true that setting up an ion exchange water system will effectively soften hard water. Unfortunately, a great ion exchange filter demands a price of more than a hundred dollars, which is not affordable for every family. On the contrary, if we are successful, our bacteria filters will have a lower price. Therefore, if we create a type of bacteria that enables hard water softening, more places will be able to drink and use soft water. As for the United Kingdom, about 60% water supply is considered ‘hard’. Much more severely, nearly all water supply in China, which is our home country, have the problem of water hardness. All of my friends who live in Beijing, including me, have the experience of finding calcium precipitates on our mugs. Another important aspect of our project is that it is mainly conducted by high school students. For most of our team, this project is their first time doing such significant scientific research, although some of us have more experience. Our project is going great despite the financial requirements. Therefore, your help will encourage us a lot. If you exceed your funding goal what additional research would you do, please explain? The goal we set for this year is to enable bacteria to collect calcium ions. If we get more than our funding goal, we will focus on improving the efficiency of our bacteria. We will test the result in a more delicate way because we will have more resources to do so. We are BNDS_China, the 2016 International Genetically Engineered Machine (iGEM) team at Beijing National Day School, China. Here is a link to our team profile on the iGem website. Our Principle Investigator (PI) is Xiaoling Yao, who has been studying molecular biology for more than ten years. She graduated from Beijing Forestry University and studied at City University of New York. The secondary PI of our team is David Brackett who graduated from University of California, Davis with a Ph.D. degree. He now teaches us Chemistry at Beijing National Day School. Before he became our PI, he was the Professor in the chemistry department at Portland Community College. 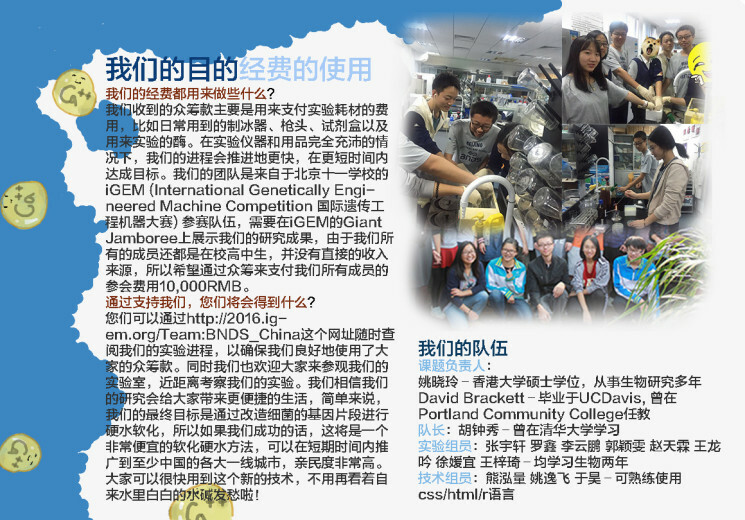 I am Zhongxiu Hu, the team leader of BNDS_China, and a eleventh grader. Molecular biology is my favorite field, and I had an experience of studying in Tsing Hua University for two years. 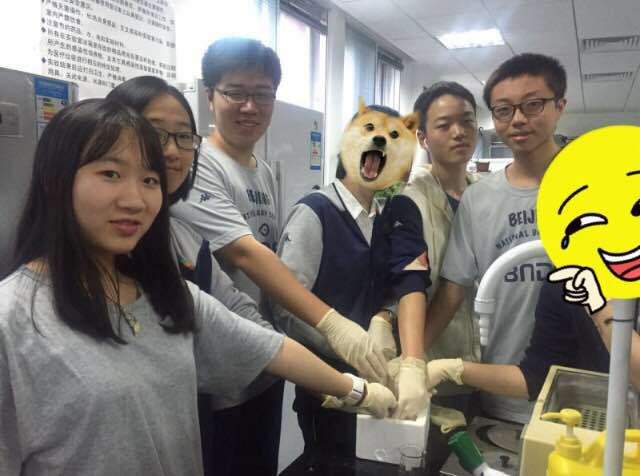 My teammate Yunpeng Li, Xin Luo, Ziqi Wang, Yuanyi Xu and Yingwen Guo help with conducting all the experiments with Yao and me. They are all seniors who have learned biology for at least two years. 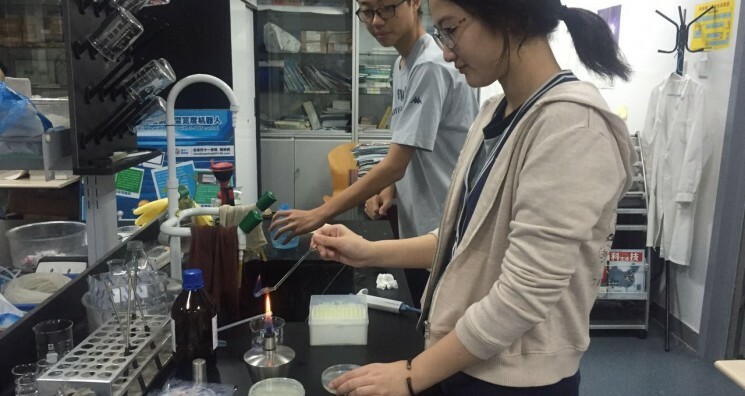 As well as those seniors, Longyin Wang who is an eleventh grader is also a member of our experiment part. He has a great interest in Molecular Biology and doing experiments. Hongliang Xiong, Hao Yu and Yifei Yao are our computer people. They build the model of our circuit and the wiki (Our webpage).